You know the old adage, good things come in small packages… well I’ve got another for you: Great things come in great packages. If you are looking for the perfect new-mum/new-baby gift, then look no further than Jellybox. With a large collection of luxury gifts for boys and girls of assorted ages, it’s a really interesting concept for a business, especially when the media fills us with tales of woe and financial doom every day – by focussing on high quality, organic, beautiful products, Elizabeth Walters has created a business that whilst delivering value for money – delivers top quality goods. In order to test out the service, we ordered a soft book for our 18monther. He’s just started to love his books and nothing he likes more that picking up a book and demanding some mummy or daddy time to flick through the pages with him… well at least until about 3 pages from the end where his excitement for the next book gets the better of him and he’s off to the bookshelf for the next one. When the package arrived, you knew you were in receipt of something special. Everything about the packaging has been thought through with care and attention to the smallest details. 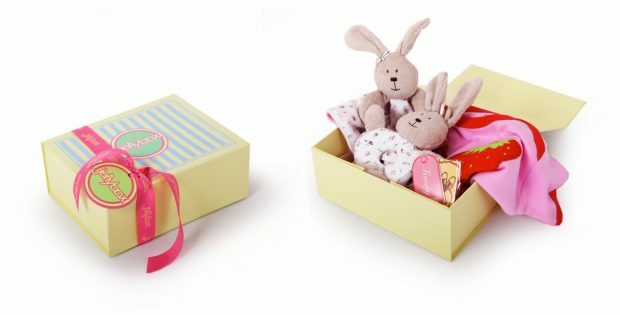 We opened the outer box, branded with the Jellybox attractive colour scheme and inside was a fragranced, hand-packed Jellybox their trademark keepsake box come packaging. As adults, it was impressive to see this level of care taken in the packaging, when we’re all so used to the polystyrene and wire contraptions that most children’s toys arrive in nowadays. As an 18 month old baby (not letting go yet 🙂 ), ok, toddler, the thrill of opening a brightly coloured box, full of exciting packing materials only to find a wonderful soft book inside was almost too much. I would highly recommend taking a look at the website www.jellyboxuk.com – there are gifts from £5 and the Jellybox keepsake box comes as standard for gifts above £20. For a gift for a new baby, it’s beautiful.